The author is a proponent of natural therapies to relieve stress and anxiety. She has used them to treat her own diabetes for years and has written how to employ them to assist in the treatment of autism. In this book, Perez provides an overview of the autism spectrum. While there is a myriad of symptoms and behaviors, all autistic children suffer from communication and socialization issues. Autism appears to have connections with both genetics and the environment. The heart of the book deals with treatments. 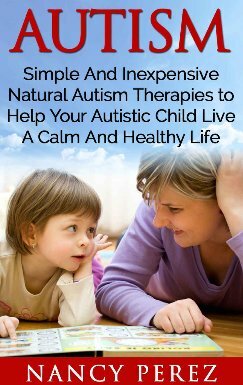 While many patients diagnosed with autism require some sort of medication, Perez focuses on more natural treatments. A definite diagnosis is often not made until after age five, but early intervention is important to address a child’s needs. Speech, physical and occupational therapy may be needed as well as special education to address cognition. Depending on the issues the individual faces, music therapy, art therapy, animal therapy, nature therapy, and swing therapy, might be effective interventions. I found the discussion of using horses (hippotherapy) to help a child process sensory movements enlightening. Simpler steps that can be implemented easily in the home include removing chemical products, massaging the child, experimenting with dietary needs, and introducing yoga. Learning each child’s preferences and needs is the most difficult aspect of living and working with a child on the autistic spectrum. As an educator who has worked as a member of an interdisciplinary team treating autistic children, I would definitely recommend this book to parents and educators who are new to the field of autism as an easy to read introduction to the subject.